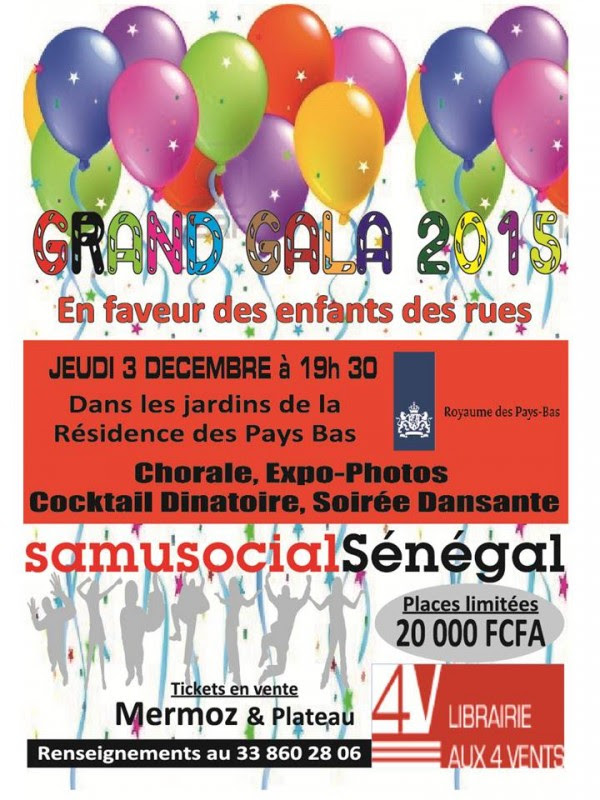 On Thursday, December 3rd, 2015, 19:30, in the Jardins de la Résidence of the Dutch Embassy (Avenue des Ambassadeurs, Fann résidence) a great Gala night on behalf of street kids of Dakar will be organized. The party will be great with a delicious buffet, a choir composed of Samusocial and Dutch kids (they are currently heavily rehearsing with lots of dedication! ), picture exhibits, music with a DJ. A great night is awaiting us while still supporting the work done by Samusocial over the last 12 years .... on behalf of street kids!!! This would not have happened without the generosity and involvement of Mr. Theo Peters, the Dutch Ambassador to Senegal. Please feel free to contact Mrs Idir (Green Room at the Elementary division) if you want to be part of it. She has tickets to sell. Please read on to find out more about Samusocial. Samusocial is a French International NGO created in 1998 by Doctor Xavier Emmanuelli, one of the founders of Médecins Sans Frontières (MSF), known internationally in English as Doctors Without Borders. Samusocial is based in several cities in France and worldwide. Its purpose is to provide care and medical ambulatory aid to homeless people. Here in Senegal, Samusocial provides emergency service (shelter, medical aid) for street boys and girls, with or without babies. These children have been through difficult and traumatic experiences - some are from homeless families and others have run away from abusive Talibe situations. Samusocial also has mobile units that distribute food, hot drinks, blankets, etc. The NGO is housed in a building near the statue in Mamelles.